Maybe I'm alone here, but I always find myself with little odds and ends of cheese, or cheese a bit too dried out to eat plain, or just a few dry bits close to the rind. Devotees might remember the idea of preserving soft cheese in oil, but that is not very effective for firm or hard cheeses. There's a French recipe (well, more of a hodgepodge than a recipe) called fromage fort (strong cheese) that's great for putting those less-than-perfect bits to use. Simply put, grind the cheese to oblivion in a food processor and spread on toast. Traditionally, the mixture was left in a cool larder to ripen for a few days, but you can skip that if you want. Since you're basically making a cheese spread, you do need some soft cheese to make it spreadable. Brie or triple cremes work, but I used cream cheese (as that was also left over). I used five different cheeses for this spread, but you can use however many you have leftover. In the mixing bowl you can see orange gouda, hard little knobs of grana padano, sheep's milk Kefalotyri from Greece, Kerrygold Swiss, and a small bit of Leyden. Leyden is filled with cumin seeds, so I didn't use a lot of that, as it would perfume the whole thing with toasty cumin. Not a bad thing, but not what I was after. At this point, you can flavor your cheese spread with garlic, horseradish, herbs, or spices. I went with two garlic cloves, some black pepper, parsley, and hot sauce. I also needed to add a bit of salt, as none of the cheeses was very salty. 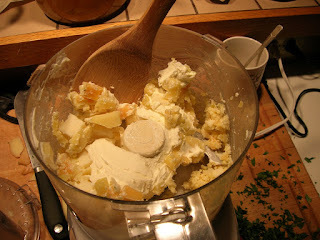 If you use feta or pecorino romano, however, test before you add salt. 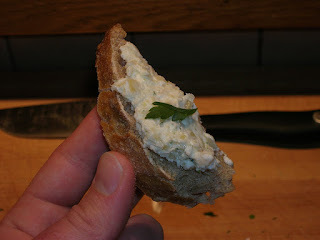 Be careful with blue cheeses, which will quickly spread their tangy bite through the entire mixture. Cut the cheese to cubes and blitz in the Cuisinart until smooth and spreadable. If it's too thick, add some white wine to thin it out. Let it sit in the fridge for a day so the flavorings mingle, then you're good to go! 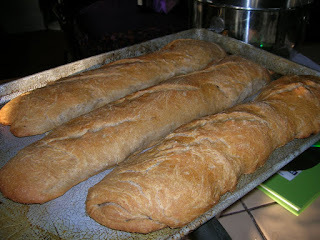 As a quick aside, I served this spread on my first attempt at making baguettes. King Arthur Flour maintains a beautiful website and has great walk-throughs for their recipes. I was really impressed with the crackly crust I ended up with, even though the overall shape of my baguettes ended up looking a bit deflated. I think I used too much water in my starter, so the dough was not as dry and tight as it should have been. That's why they sunk and spread out on the baking sheet. Still, tasty results worth repeating!